Anupa has learned the craft of BharataNătyam under the tutelage of Padmashri Guru Saroja Vaidyanathan. Guru Saroja has been and continues to be her guiding inspiration. Anupa continues to hone her dance form by taking trips to India to learn from her Guru whenever she can. Inspired by her Guru, Anupa believes that she can best express herself through BharataNătyam, through the nuances that the mudras have conveyed for centuries, through the steps that narrate a story with dramatic content, through the eyes that reveal so much of passions that churn within. She believes that in this fast-changing world where more flippant forms of performing arts win easy and immediate acceptance, this ancient form combining bhav, raag and taal has its own place, its own nice, its own audience. She feels that the form has a lot to give in our times and can portray all emotions that stir us daily even in this day and age. Padmashri Guru Saroja Vaidyanathan trained under the accomplished Guru Lalitha of Saraswati Gana Nilayam from a very tender age of seven years. She is the third generation (parampara) disciple of the famous Guru Kattumannar Muthukumaran Pillai. She has also undergone training in Carnatic music under Prof.P.Sambamoorthy at the Madras University. 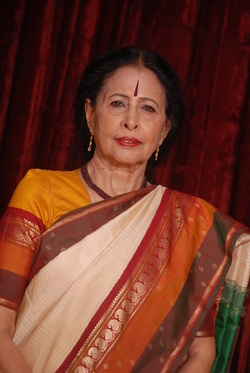 Saroja has been one of India's prominent BharataNătyam exponents earning her fame as an intelligent and innovative choreographer. Her dance repertoire has revolved around subjects ranging from mythology to current social issues that have been widely acclaimed by the audience and the critics alike. She has widely traveled within India as well as abroad performing and giving lecture demonstrations at various prestigious venues. She has also choreographed over a score of enthralling ballets based on mythology as well as social themes that have been appreciated and repeatedly sponsored.